This Week's Ad: Will Congress give 8th 'chain migration amnesty'? 1. Congress has already rewarded millions of illegal border crossers and visa overstayers with 7 amnesties. Yes, SEVEN! 2. Every amnesty thus far has been a "chain migration amnesty." It has allowed every recipient to start whole new chains of immigration into the outer reaches of their families -- and into chains of in-laws, and in-laws of in-laws, that stretch over decades. Don't forget to click "likes" and to leave a comment for other visitors to see. And share it with all the people you think may not know these amnesty secrets. 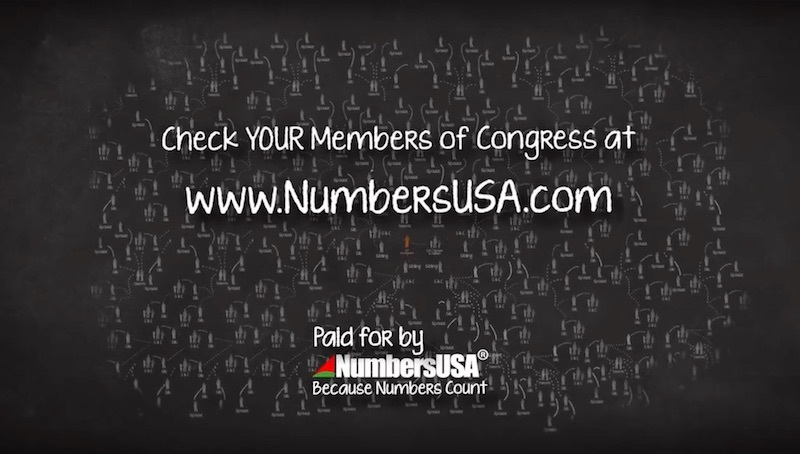 I believe the ad has to startle nearly every viewer (except the more than 8 million who follow NumbersUSA through email and Facebook). Most Americans believe the last amnesty -- and the only amnesty -- for illegal aliens was in 1986. NARRATOR: Since 1986, Congress has encouraged illegal immigration with SEVEN amnesties. In the last decade, I don't think I've ever seen any of the mainstream media refer to any other amnesties but the first one in 1986. That plays well into the pro-amnesty narrative that, because it has been three decades since the last amnesty, it really shouldn't be such a big deal to have one more so many decades later. 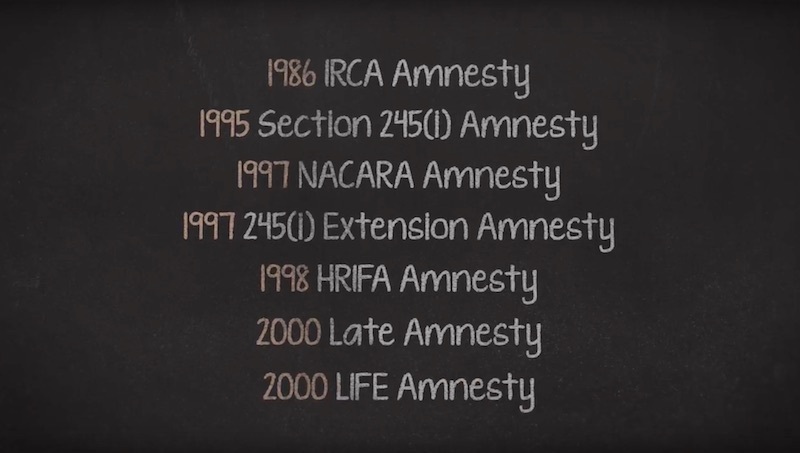 But the NumbersUSA ad lists the six amnesties adopted after the first one and visually reminds viewers that Congress has repeatedly tried amnesties as a way to deal with illegal migration. It hasn't worked, has it? And each amnesty is an acknowledgement that the previous amnesties failed. In fact, each amnesty just encouraged MORE illegal migration. NARRATOR: EACH amnesty allowed EACH illegal worker to start chains of migration for extended family. Of course, not every immigrant or amnestied illegal alien makes full use of the chain opportunities. And there are caps that keep the number of chain migrants each year from getting totally out of control. But each amnestied illegal alien indeed IS ALLOWED to start new chains. The ad's chalkboard illustration shows what CAN happen if the original amnesty recipient is married and has two siblings and a mother and father. Each of those is allowed to have a lifetime work permit and lifetime access to taxpayer benefits without any regard to skills or education or how Americans in the same job fields might be affected by their competition. NARRATOR: 30 years later, aunts, uncles, distant cousins and in-laws of the original illegal workers continue to come and get lifetime work permits through Chain Migration. Immigration expansionist activists -- and their sympathizers in the mainstream media -- immediately recoil when they hear the words "aunts, uncles and cousins." "Immigration law does NOT allow people to bring in their aunts, uncles and cousins!" they will proclaim confidently with an implied boisterous AHA, GOTCHA! And they are right. Each immigrant and amnestied illegal alien can petition ONLY for their spouse, minor children, brothers, sisters, unmarried adult children, married adult children, and parents. Only! But the chain migration that each immigrant and amnestied illegal alien starts DOES allow for bringing in far more than that. Stop the ad on every second to notice how the chain migration quickly spins a spider web of much more distant relatives of the original recipient (the "orange man"). Because the 1st Immigrant's parents can bring in THEIR siblings, that means the 1st Immigrant's "chain" is bringing in his/her aunts and uncles. And because those aunts and uncles can bring in THEIR children, that means the 1st Immigrant's "chain" is bringing in his/her cousins. By the same process, the parents can bring in THEIR parents which means grandparents of the 1st Immigrant. And on and on it can go. 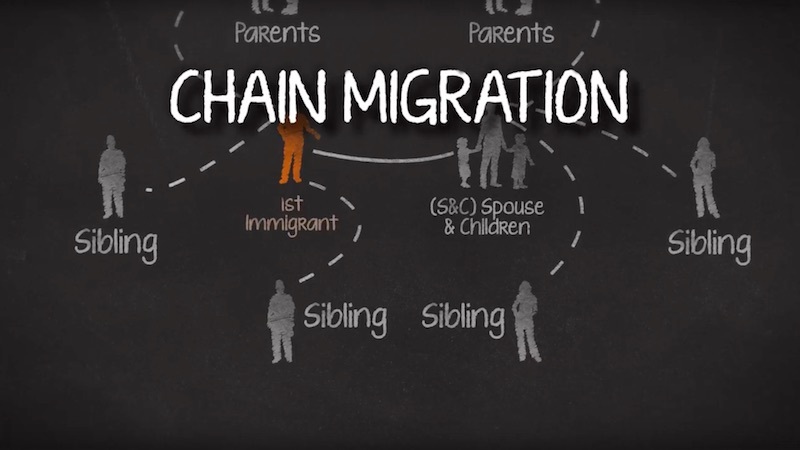 The 1st Immigrant may not be bringing in those extended relatives, but his/her "chain" does. The spider web is craziest due to how the spouses of all the family members create layer upon layer of in-laws with no connection to the original family at all. Today, foreign citizens who are unknown to those "1st Immigrants" amnestied in 1986 are being given lifetime residency and work permits as a result chains started by those 1st Immigrants more than 30 years ago. And there is nothing under current law to keep those chains from spreading for 30, 60 and 90 more years. NARRATOR: Now, Congress is considering an EIGHTH amnesty. . . . And MORE Chain Migration? Where do YOUR Members of Congress stand? Paid for by NumbersUSA because numbers count. In this case, the tangled web is not an unintended result of the deception but the very purpose of deception by the amnesty pushers. Any talk by any politician, journalist or other commentator about a "compassionate" response to so-called "childhood arrivals" that doesn't mention chain migration has to be regarded as deliberate deception. And the deception is intended to mask the new never-ending webs of chain migration they hope to weave outside the control of the American people.